Fort Shafter (157.89W 21.34N) was the headquarters of the Hawaiian Department. 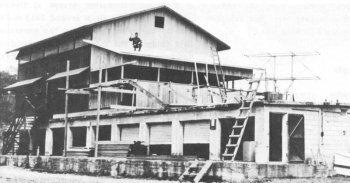 The fort was equipped with an SCR-270B radar and had a newly constructed fighter interception center (pictured) when war broke out. The fort included a forward command post tunneled into Aliamanu Crater (157.914W 21.362N) three miles to the west. Because of the exposed position of Fort Shafter (on the slopes of the Koolau Mountains) the headquarters of the Hawaiian Department had frequently rehearsed a move into the command post, and actually carried out the move under fire during the attack on Pearl Harbor.